Can I trust an instrument that is filled with schnaps*? I admit, until now I believed the magnetic compass and turn coordinator were instruments that randomly tumbled around. The magnetic compass has so many errors, I rather only used it in cruise to reset the directional gyro every 15 minutes. During the last flights I had issues to keep the compass in my scan. 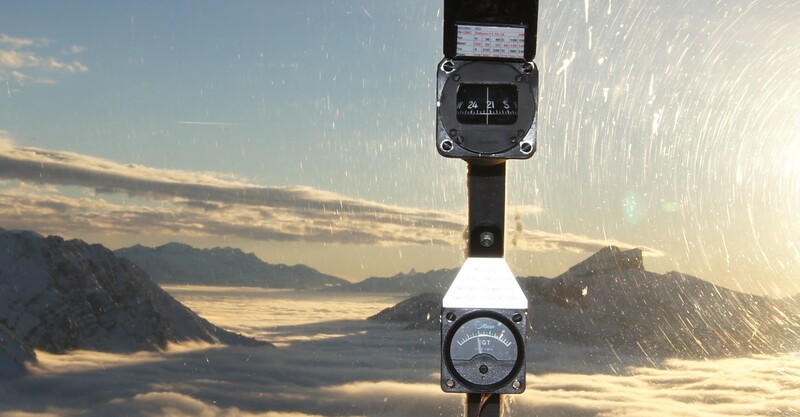 Today I worked more than three hours on this in the Redbird FMX, all the time with vacuum failure – without attitude indicator and directional gyro. Now I have a better knowledge of how to interpret the instruments and when to trust them. A magnetic compass – can you trust in what it’s telling you? There is a simple difference in the way one has to read the compass and the directional gyro. The DG is very simple. Thanks to a spinning disc – a gyroscope – which remains rigid in space, the airplane turns around the instrument. There is no doubt, it is a very precise instrument but you have to reset it according to the magnetic compass all 15 minutes, or more often in turbulence. Reading the directional gyro is very simple. On the picture below the heading is about 305° and if you want to turn on a heading of 330° you simply turn right towards the new heading. Needless to say that this doesn’t change when the DG fails and you are using the magnetic compass. But now, let us look at the picture above. If you want to turn from the current heading 215° to 180° you have to turn away from the desired heading, or pull it towards you. I know, it isn’t a complicated difference, we are simply looking at a compass from behind. Tell that my brain, you surely know it isn’t easy to break a unconcious habit. “Six pack”, the directional gyro (DG) in the bottom middle. Since there is never no wind you also have to think about the wind correction. I made the mistake to visualize it on the compass and that doesn’t work for me. The main lesson I learned today is to never fixate on the compass, if you try to “chase” your headings you end up in constant left or right banks. When is a compass reading wrong? In a bank and when de-/accelerating. In other words, I never really maintained a certain heading but always tried to correct. The issue is that if you are in a bank all the time, the compass won’t tell you anything useful and you don’t know what you actually are correcting for. After one and a half hours of making mistakes and feeling as if I didn’t know in which general direction I should turn, my instructor found the right words to lead me back on track. 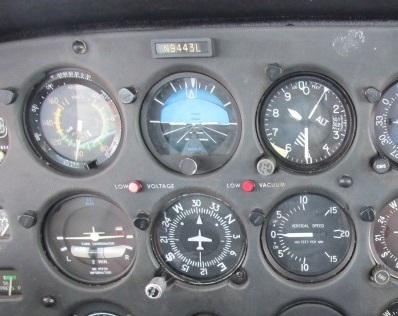 Read the compass with wings level on a heading that you think is appropriate, then if this heading is working, look at the turn coordinator (lower left in the sixpack) to keep your wings level. Without a bank, your heading won’t change. This worked for me, I stopped staring at the compass and tried to make sense out of the movement of the miniature airplane. As always, there was moderate turbulence causing the turn coordinator to bank and I had to learn not to over-correct. Here a few illustrations of my adventures in the clouds. The first two, you can tell, were flown with the magnetic compass. I really want to become proficient, so that they look like illustration #3, where I flew with working systems. #1 Vacuum failure on the VOR approach at Jeffco, KBJC. #2 Vacuum failure on the ILS/LOC into Front Range, KFTG. 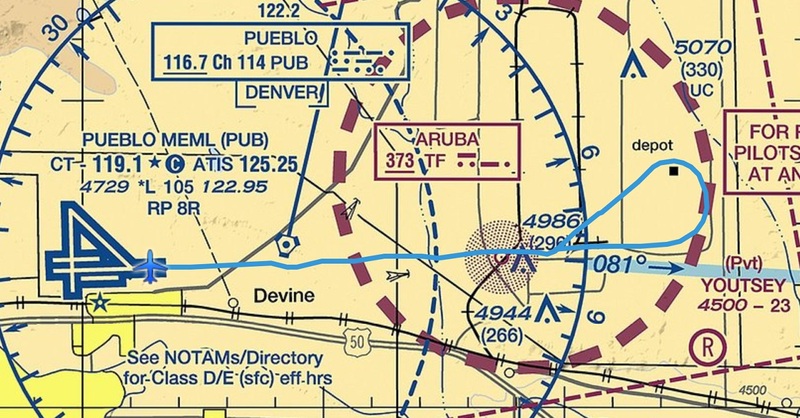 #3 Systems working properly on the ILS into Pueblo, KPUB. I understand now better, when to read the compass and when not. Climbs and descents, no problem. During banks and acceleration, better not. 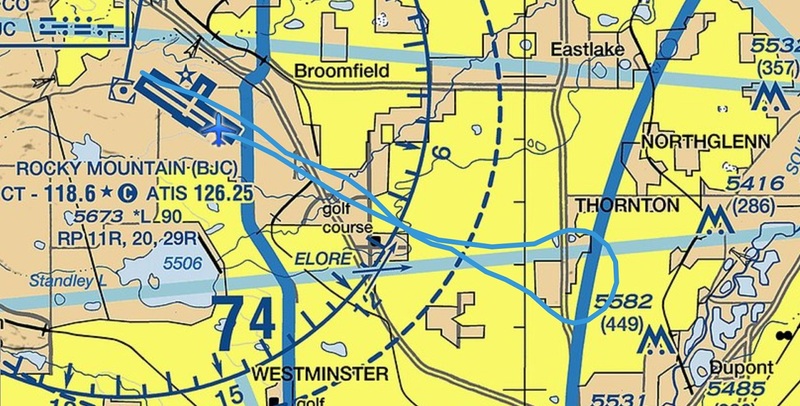 This is also a reason to keep a certain approach speed, you have to treat the compass well or it’ll lie to you. Many things I already knew, but never really used it – and if knowledge isn’t applied it isn’t of much use, right? For example, during turns the compass indicates correct if the magnetic dip is perpendicular to the magnetic lines. In other words, when you pass East or West, you have a moment where you can read the instrument. This can be helpful to make a procedure turn and verify the time left to turn onto the interception angle. Joshua had realized after the first lesson that I was slowly loosing my spirit, approach after approach. So he decided to turn on the systems again for an ILS into Pueblo with full panel. The procedure turn went great, I intercepted the glideslope and kept the needles centered all the way to minimums. Right at the time of my callout, the big runway appeared out of the clouds, exactly on centerline, with the correct wind correction angle, at 200ft/60 meters above ground. It seemed, I made progress during the last hours, even if it felt as if I was stuck. Now I am in a very positive attitude and I want to nail these partial panel approaches. How hard can it be? * I know that the fluid in a magnetic compass isn’t schnaps. Nevertheless, in Switzerland we call them “Schnapskompass”.